Hot picks for game and book creation, reading, and more. What are your top 10 tech tool recommendations?” Sounds like an easy question, right? I came up with far more than 10—including apps, websites, and devices that piqued my interest at this year’s ISTE (International Society for Technology in Education) conference, and others that I’ve geeked out over recently with fellow techie teachers and librarians. As the library director at Worcester (MA) Academy, I’m especially looking forward to playing Breakout EDU games with students and faculty; introducing history teachers to the Smithsonian Learning Lab; and using tools such as BOSEbuild Speaker Cube and Morphi in our maker space. Here are my top picks. Bloxels was a big presence at ISTE this summer and is so popular that as of press time, it was out of stock. 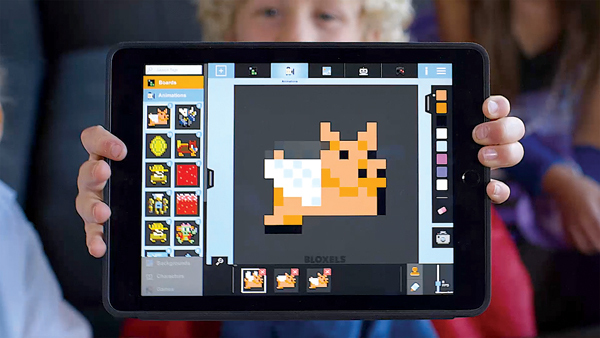 A combination of an offline and online video game creation tool, Bloxels lets children create the setting and hero for a video game using physical, color-coded, pixel-like blocks and a gameboard. Then, using the Bloxels Builder app (free, iOS, Android, Kindle), kids take a photo of their creations and can play and share their game in the app. Game building is a great way for students to experience the design process and work on critical thinking and problem-solving skills. Once a game is uploaded to the app, students can revise it, making it more complex as they develop an understanding of the game’s logic. Teachers can access an educator’s guide and lesson plans on the Bloxels website. Book Creator (available for iOS, Android, and Windows) is a great tool for designing interactive books and stories. This app is a big hit at my school and is used across grade levels and in math, science, literacy, and world language classes. Users can create one book for free or pay for the full version ($4.99 for iOS, $2.49 for Android) to develop as many books as they want. 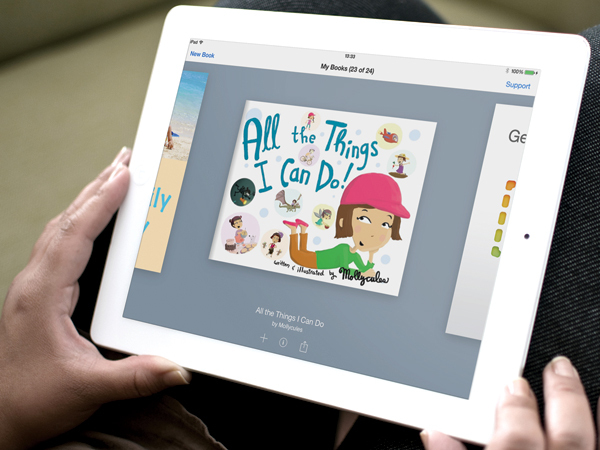 Book Creator allows them to insert photos, text, music, and videos, and publish the result via iBooks. Layout options let students create standard or comic book formats. Collaborative features permit multiple users to create and merge stories into one volume, allowing for whole-class titles that can be published and shared. 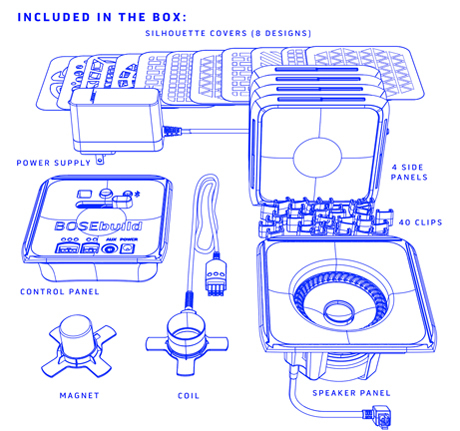 The BOSEbuild Speaker Cube ($149, iOS) is a tool for building and customizing a bluetooth speaker. Launched in June, this is a promising addition to makerspaces and STEAM classes. Students can explore electromagnets, sound, and frequency as they engineer their speaker with guidance from the BOSEbuild Sound app. All parts needed for assembly are included in the kit, with no soldering required. Fifteen activities engage kids in understanding the parts of a speaker, how sound is made, and how magnets work. The speaker can be taken apart and reassembled. Breakout EDU, the collaborative, game-based learning experience, has been receiving lots of buzz. From PD workshops to classrooms, this is a new favorite interactive educational tool. There are a few ways to use Breakout EDU. Purchase a kit from the website or make your own with pieces recommended by the Breakout EDU team. One kit is all you need to play countless games that teach math, history, science, music, Spanish, finance, English, and more. Use one of the games available from the Breakout EDU site or create your own. Games are password-protected, but teachers can complete a contact form to unlock the password. Spyder Heist was a huge hit with sixth grade math classes in my school. The DJI Phantom 4 drone is pricey—$1,399 on the DJI website, $1,329 from Amazon—and certainly won’t be on the top of the must-have list for everyone. But if you can afford it (or have generous donors), it’s a great addition to a library maker space. Why a drone? And why this drone? Rated the top drone of 2016 by PCMag and CNET, the Phantom 4 comes with a high-quality 4K, built-in camera and has a battery life of 28 minutes. 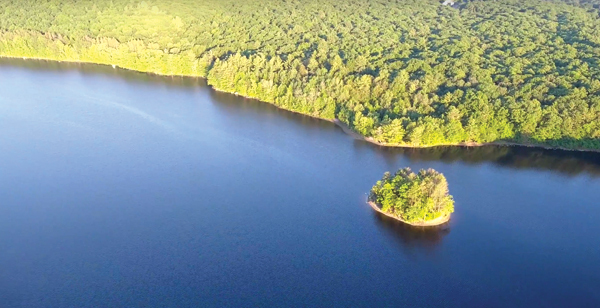 It can also capture GPS data, record height and feet flown, and save maps of the drone route, making this a valuable tool for learning about speed, distance, geography, and more. How about using a drone for digital storytelling? Imagine the possibilities. Storyboard where you want to fly, at what height, for how long, what images the camera will capture, and at what angle. Combine math, science, and literacy components for memorable interdisciplinary lessons. 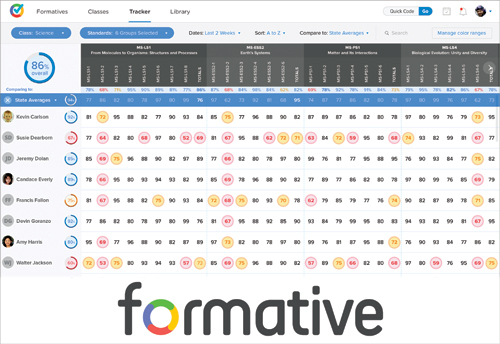 Formative will transform the way you assess student work. This free website allows for traditional multiple choice and true/false questions but also provides more interactive visual assessment options. Teachers can upload videos and photos, or write on a blank screen to create classwork or homework assignments or tests. Students can respond via text or a drawing based on question types. Because teachers can view results in real time, this is a great tool for in-class assessments where teachers must quickly gauge understanding and review content if necessary. Students can access assignments and quizzes through a code, through Google Apps for Education accounts, or through teacher-created accounts. If your school uses tablets, consider using Formative to take advantage of the interactive features of the devices for classwork and tests. Google Cast for Education, also announced by Google this summer, is a free, Chrome-based app that projects teacher and student devices in a classroom. Similar to the Reflector 2 app and Apple AirPlay, Google Cast wirelessly mirrors any device in the classroom without needing extra hardware. Teachers can provide students with different levels of access—“project” and “request to project”; the tool projects from one student device at a time. While this is a solid, free alternative to other projection options, Google Cast is currently only available for Chromebooks or laptop and desktop devices through the Chrome browser. LiquidText (free, iOS) is a reading app that provides a workspace for users to take notes, write annotations, and create excerpts. They’ll also be able to import PDFs, Word documents, or web pages using the built-in browser window. I’m particularly excited about this app because of the many ways it can be used with students. 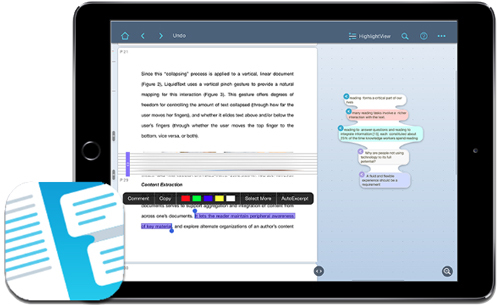 For close reading exercises, students can employ the app features to take notes, highlight main ideas, and write questions in the workspace. Researchers can download PDFs of articles and import them into LiquidText to take notes, write annotations, excerpt passages, and organize ideas for papers and projects. Morphi, a 3-D design app, was another great ISTE find. This app is available for iPad for free, or through education volume licensing for $8.99 per device. Android and iPhone apps are in the works. Several features make this app a winner. From the settings option, students can choose the 3-D printer model to which they’ll print, making the design space customized to the printer’s build plate. Printer options include multiple MakerBot and Ultimaker models as well as other brands. Designing 3-D models is as easy as dragging and dropping geometric shapes onto the build grid, and a whiteboard feature allows users to draw designs or import photos. Export and share options make it easy to export STL files to email and share via Thingiverse. Project Bloks, a tangible programming platform, was among Google’s many product announcements at ISTE. Still in the prototype phase, Project Bloks consists of a brain board, pucks, and base boards. The brain board is built on a Raspberry Pi Zero and is the power module. Base boards connect to the brain board in a linear fashion, reminiscent of littleBits, and pucks are placed on the base boards to provide the commands for the program. As of press time, Project Bloks was not available for purchase, but keep an eye on its development. This idea offers lots of promise in teaching computational thinking and coding in a tactile, hands-on manner. 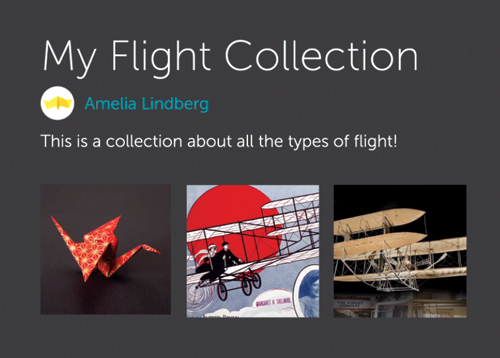 The Smithsonian Learning Lab is a new website offering millions of free, digitized resources from the Smithsonian’s collections for teachers and students. Create an account or log in using Facebook or Google. This educator-friendly platform allows teachers and librarians to curate, organize, and share resources, as well as create class rosters, upload additional resources, and devise assignments. Consider flipping your teaching and ask students to curate, annotate, and share their own collections. Drawing on materials from the Smithsonian’s 19 museums, the National Zoo, and several research centers, the Learning Lab resources cover all disciplines and grade levels. What new tools are you using in your library or classroom? Tell us about them in the comments section. 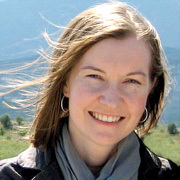 Jennifer Hanson is the director of library services at Worcester (MA) Academy. Jennifer, thank you for shedding some light on the new tech tools for school. At first it could seem easy to write a post about great apps and tools for students, but with an astonishing amount of new tools that hit the market every year, this task is not simple. I'd like to mention one more tool that was on the ICTE 2016. It is called Unplag, and it can be found here: https://unplag.com. It's basically a plagiarism detection system, but with its recently rolled out "exclude self-plagiarism option" for Canvas LMS, it looks really promising. A lot people in the Canvas Community are discussing the performance of this tool.